Americans anxiously awaited a decision Thursday involving a young African American man. Some thought an entire community would erupt in riots based on the outcome. You might think I’m referring to star basketball player LeBron James choosing to “take his talents” to South Beach. I’m not. While TV media hyped “The Decision” for hours and millions seemed more concerned about a rich guy’s job situation than they did about their own, another decision came down in a Los Angeles courtroom with far more serious implications. I heard about the verdict and shook my head in disgust. A jury found an Oakland transit officer, Johannes Mehserle, guilty of involuntary manslaughter in the New Year’s Day 2009 shooting death of an unarmed black man, Oscar Grant III. I was relieved Mehserle was convicted at all, which is rare in fatal police shootings. In the cases of Amadou Diallo and Sean Bell, remember, officers were acquitted of all charges. However, Mehserle was acquitted of second-degree murder and voluntary manslaughter. His sentence could see him serving less jail time than a non-violent drug offender. If the jury believed Mehserle’s testimony, then a key follow-up was ignored: Was Mehserle justified in using his Taser, let alone any weapon? The Taser has been implicated in playing a role in suspects’ deaths. And there have been cases in which a gun wasn’t even involved—see Anthony Baez. Therefore the issue is not the gun; it’s police brutality. 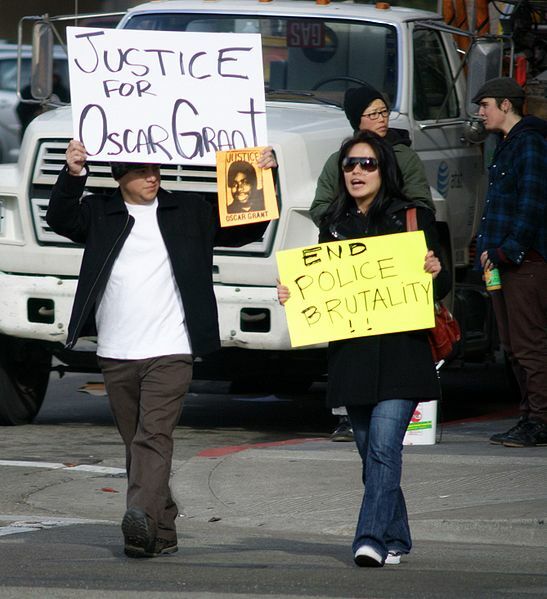 The choice to use excessive force murdered Oscar Grant. Johannes Mehserle made that choice. So was Mehserle justified in using a Taser? Police had been investigating reports of fighting on the train and had gathered a handful of young men thought to be involved. Accounts differ on Grant’s actions: the police say he was resisting arrest; witnesses say he was attempting to diffuse the fight. What’s obvious is just before the shooting, Grant lay prone on the platform with another officer pinning him down. Afterwards, the usual story played out: the authorities’ “official” account characterized the suspects as thugs. But in the YouTube era, almost everyone in that BART station had a cell phone camera. Multiple videos immediately surfaced. For me, the loud pop is the most chilling moment—out of proportion to what we’re seeing. After all, officers were responding to reports of a fistfight. If Mehserle decided to use his Taser only because he saw Grant as a threat, simply because he was young and black, then on a different night in a different place, the victim could have been LeBron James, or any black male, or anyone, period. Until we confront police brutality—by punishing officers who murder unarmed citizens—we will continue to see the same pattern of abuse, no accountability, and tragic loss of life.